The front: Nice action shot at a sun-drenched Yankee Stadium. The back: The Red Sox were below .500 in 1980, but the four-game sweep was critical in keeping the Yankees ahead of the Orioles in a race that ended up being won by the Yankees by three games. 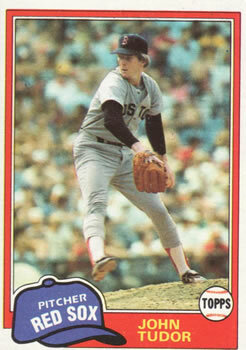 The player: Davis is often considered the first eighth-inning reliever, with three sensational seasons pitching before Goose Gossage in the Yankees’ bullpen. 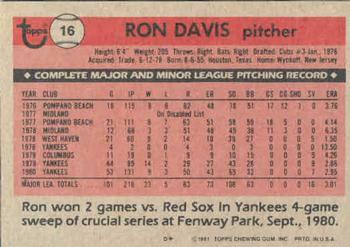 In fact, the “hold” statistic was created in part to quantify Davis’s impact on the Yankees. 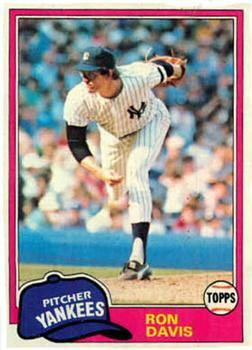 The Twins traded Roy Smalley to the Yankees for Davis after the 1981 season, with the idea of making him their closer. Despite 96 saves in four seasons with the Twins, Davis was considered a disappointment due to several high-profile blown saves. He finished his career with brief stops with the Cubs, Dodgers and Giants. The man: During the 1981 baseball strike, Davis worked at the Hyatt Regency Hotel in Kansas City. A building collapse there killed 113 and injured 186; Davis helped in the rescue efforts. Davis is now a highly successful youth coach in Arizona, owner of Team Davis Baseball. Perhaps his best student was his son Ike Davis, who later starred for the New York Mets. My collection: I have 26 of his cards, from 1980 to 1990. I would be interested in trading for 1981 O-Pee-Chee #16. These two cards came to me yesterday from MiJohn, a follow-up from an earlier trade. These cards actually go together pretty well, as Pedro Martinez was recently in the news for claiming (accurately) that the Yankees have been playing without energy since Judge got hurt. Another listless loss last night to the 53-80 White Sox just proves Pedro's point even more. 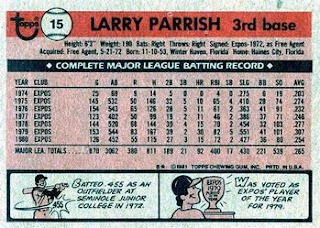 The front: As someone who began collecting in the junk wax era when Parrish was a clean-shaven Ranger, it’s a little strange seeing him as a bearded Expo. 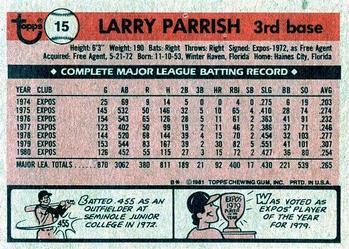 The back: Parrish had a career year in 1979, but injuries he suffered that year would dog him throughout his career. 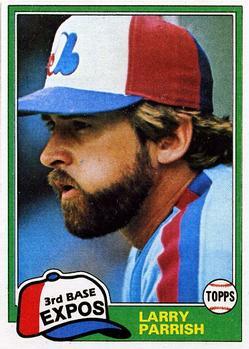 The player: Right before the 1982 season the Expos traded Parrish to Texas for Al Oliver. He had six solid seasons for the Rangers, twice topping 100 RBI. He was traded to Boston in 1988 and finished his career with two seasons in Japan. The man: A major league coach and minor league manager for many years, he retired after the 2015 season. My collection: I have 44 of his cards, from 1978 to 1989. I would be interested in trading for 1976 Topps #141 and 1977 Topps #526. One of the newer blogs out there is Diamond Jesters. Diamond Jesters has a really cool project going on called Time Travel Trading. Matt bought a pack of 2018 Topps cards in the beginning of the year, with the idea of starting a series of trades where each time the cards that came back were older and older. In other words, you can claim any card as long as you send back an older one. The trade stack now has mostly 1960s and 1970s cards, but the oldest one is from 1938! Go check it out. I sent Matt some '60s and '70s cards for a few modern cards I needed . . .
. . . and some awesome vintage as well. We ended up making it a bigger trade - including my first 2018 flagship cards. Yep, it took until the end of August for me to end up with some of these. That's probably because I've been focusing so much on vintage! I sent Matt a couple hundred modern Red Sox cards for the cards you see here. I would be very happy to do similar trades with other bloggers, a lot of modern cards for a few of your vintage. These were cards Matt won in a contest that didn't really fit in his collection. But they sure do fit in mine. I don't mind the writing on them at all. That Ernie Broglio card deserves a closer look. The kid who wrote "Cubs" on it didn't realize he was documenting what would become one of baseball's most famous trades. It's also interesting that he originally wrote "Traded to Mets" but then crossed it out. I can't find any mention of a possible Broglio-to-Mets trade - maybe it was just a mistake on the kid's part? A.J. 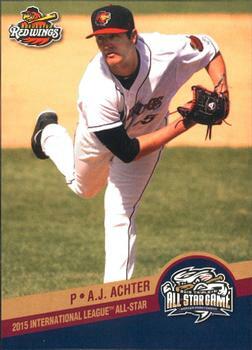 Achter pitched for the Twins and Angels from 2014 to 2016. In 45 games he went 2-1 with a 3.92 ERA. Now the pitching coach at Eastern Michigan University, he kindly answered my questions about baseball cards. Only story I have is the 1st time I saw my big league card was I was signing autographs in spring training of 2015, I didn't even know Topps made a card of me and someone hands it to me to autograph. 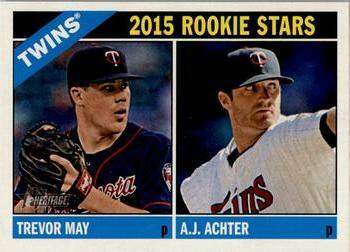 I was shocked to have a card, even if I was sharing it with one of my teammates, Trevor May. I was something I will never forget. That Topps Heritage card is awesome, then in the minor leagues I made 4 all star teams so those are all special cards as well. I used to collect baseball cards when I was younger, I still have them all at my parents house but haven't gone through them in years. Katz's Fine Furniture still exists, but has not at this Stanton Street location for many years. It is now the site of a trendy restaurant, Beauty & Essex, which has still retained some of the Katz's Fine Furniture signage. The front: Nice action photo. Not sure of the stadium – maybe Baltimore? If so it would be July 5, when Tudor outdueled Jim Palmer 1-0. The back: After attending North Shore Community College Tudor transferred to Georgia Southern. He played at Falmouth in 1975 instead of signing with the Mets, who had drafted him. 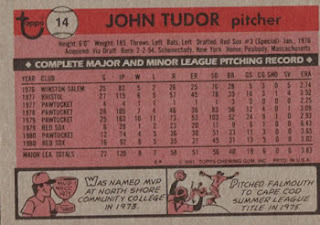 The player: Tudor was a great pitcher at times, but had trouble staying healthy, most notably having his leg broken by Barry Lyons while sitting in the dugout and Lyons was trying to catch a foul ball. His best seasons were with the Cardinals, most notably 1985 when he finished second in the Cy Young voting, going 21-8 with a 1.93 ERA. He also pitched for the Pirates and Dodgers, helping LA win the World Series in 1988. The man: After his career he was a minor league coach for a while, and still coaches youth baseball today. My collection: I have 55 of his cards, from 1981 to 1991. I would be interested in trading for 1988 Sportflics #198.